An interactive movie game that showcases independent feature films Watch four short films on a DVD organized by genres such as Comedy, Love, Fantastical, Chillers, Zombies, Dark Comedies, Pottymouth Comedies, and Powered by Girls. Dimensions (in packaging): 6.25" x 5.75" x 1.25"
This was so entertaining and made for an evening with a little something different to do with our friends! As an independent film maker I love the concept of Indieflix! I highly recommend subscribing to the monthly service. 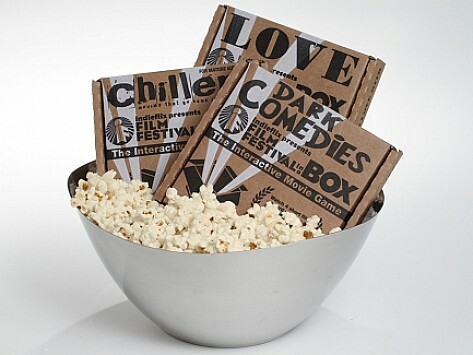 Indie flix, festival in a box was very entertaining. It was well worth the money! It is great for movie lovers!! IndieFlix is changing the independent film landscape for viewers and filmmakers alike. They connect movie lovers with incredible indie films, while helping the filmmakers behind them thrive. After screening film festivals, audience award winners, film schools, and even direct submissions, IndieFlix selects the best movies and offers them for streaming. They add new movies every week. IndieFlix supports the artists behind each movie, too. Every time a subscriber watches a movie, the filmmaker gets paid. That’s an important piece to the vision Founder Scilla Andreen had in starting the company. An award-winning filmmaker herself, Scilla wanted to bring film festivals to people’s living rooms. She realized that not everyone can travel to see great cinema. And because a vast majority of the 60,000 movies made every year never find an audience, Scilla knew there were many unseen gems with unpaid artists behind them. With over 6,000 titles across genres, and everything from feature films to shorts, there’s always something entertaining to watch. And every time you view a movie, you’re supporting the talent who made the film.